One of the most popular tips to drive the golf ball further is to “tee her high and let her fly.” In other words, by teeing the ball up higher the golf ball will have more carry and supposedly more distance along with it. 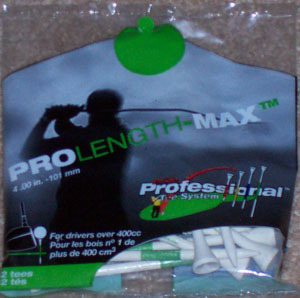 I decided to try this tip out to the maximum on the golf course by purchasing a bag of Prolength Max Professional Golf Tees. They come from Pride Golf Tee Company, which also produces three shorter versions called Short Tee, Prolength, and Prolength Plus. On the front of the bag it states that they are specifically made for “drivers over 400cc,” and one can clearly see why. They are the longest tees ever allowed by the USGA, at a whopping four inches in length. Imagine your normal golf tee and literally double or even triple the length of it and it might come close to how long these gold tees are. Are they really worth it though? Let me first start out by describing the positive and negative aspects of the tee. These golf tees certainly confirm the golf tip that teeing the ball up higher will get you more distance. I hit a few practice drives using a regular tee and then using the Prolength Max tees, and I was averaging close to ten yards longer using the latter. I would say that if there were any wind helping my drives, I could have gotten nearly 25 yards more distance than with using a regular tee. It makes that much of a difference teeing the ball up so high. I can get a great upward angle to each and every one of my drives, and the same can’t be said of using regular wooden tees. Also, I found using these tees to be a lot better for my 460cc large headed driver. Sometimes it gets difficult during a golf round trying to get the ball up in the air using a short tee with a large headed driver. Using this tee it was almost effortless getting the ball into the air. The one major downside when using the Prolength Max golf tee is that it is not very durable. For the same price one could get plastic tees, which hardly ever break. I must have broken at least six of the tees over the course of a couple of golf rounds, which is not very good to be honest. Also, another potential negative is that in order to be able to drive the golf ball with such a high tee you have to swing the club differently. You simply cannot use the same swing you normally use when hitting golf balls off of these tees. I have a self-made golf swing that can easily adapt to any situation, and so I was able to tweak my swing to hit the ball with the tee at such a high length. If one has a rigid golf swing it would be pretty hard trying to hit golf balls with the Prolength Max golf tee. So are they really worth it? The Prolength Max Professional Golf Tee can certainly add some extra yards to your drive, but overall I wouldn’t recommend that anyone buy a package. There are other ways to improve yardage, such as using a better golf ball or more up to date golf clubs. The tees just break too easily, and if you are an average golfer with a rigid golf swing it would be difficult trying to gain the extra yards at the cost of popping the ball straight up into the air every time.